usually when I anbox is not starting, I just restart the ubuntu. It works most of the time. Is there a better way to make anbox run again? Also, for those not doing this, if you are connected to anbox through adb shell and lxc-console you can see debugging msgs of anbox in realtime on your PC. This helps a lot to understand what anbox is doing, since it includes error msgs. "does is work in 'other phones'?" The only thing specific to each phone, I belive is the modification in the "boot image" to include the requeried kernel modules (for ashmen and binder nodes in /dev). Modifications in the anbox.img are the same for everyone, I believe. Hey mario, if you are going to confirm this, are there other modifications to the kernel or the boot img that you do? @mihael Haven't tried that yet as I'm on holiday and have not access to a PC to flash it. I have test this and indeed it install the apps. $ cd data && pm install "app.apk"
EDIT: sorry, I miss typed the sudo command. I just tested the new anbox update and yes, both the keyboard and network is working. I even made a whatsapp call to my father, for shits and giggles. It doesn't have sound as expected, but it did connect. this is a screenshot of a msg, but I also made a call with no sound. 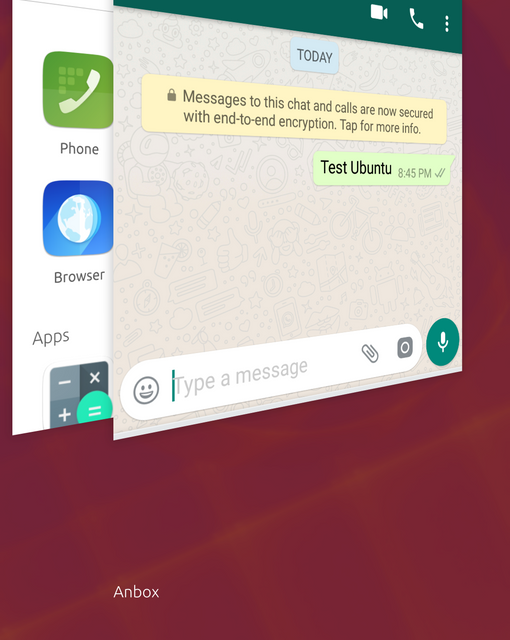 If we get the sound server working, we would be able to start making whatsapp calls! That would be awesome. Anyway, it is already a great achievement. I can confirm that the turbo-test img works on the Pro 5. I also installed WhatsApp and it works. I am so very glad and delighted about all this work!!! On N5 I recognized: Installing System updates seem to cause the reinstallation of the native kernel. This causes a disfunctionallity of anbox and heating of your device (100% CPU). I recommend to disable automatic System updates. @mihael Fair play to you on getting Anbox apps to work on the Pro5! Any chance you can reveal how you did it? When I try (on turbo/devel), like a previous poster, I'm getting "Anbox is not running" errors and when I type "anbox-tool status", it reads "Running: No" - but the preinstalled apps open and seem fine. @brywilson I only did what is recommended on this page, using the anbox-boot-turbo-test.img. I had previously tried to install anbox and it didn't work (the previous anbox-boot-turbo.img kernel) so an anbox android image was already on my device so anbox-tool install didn't work. I then used anbox-tool upgrade and then everything worked. Regarding logging into the container, yes, I use the sudo way. Yes, there are a lot of debugging messages flooding the screen but in spite of that I type the commands (thanks @Alkis for the code above)and then I hit enter and this is how I got the apk(s) installed. Somehow my anbox on OPO is still not runing even after few restarts. Is there any option to start it via terminal?